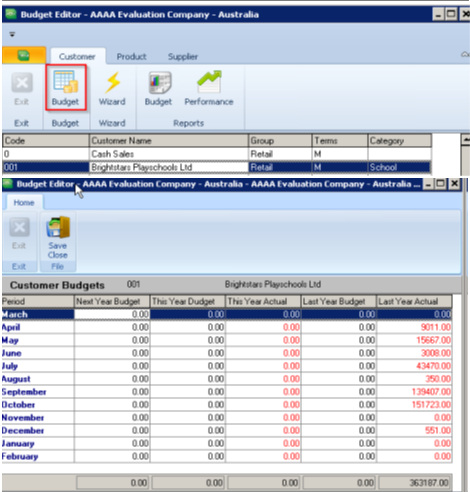 HOW DO I SET BUDGETS TO IMPROVE CUSTOMER, PRODUCT AND SUPPLIER ACTIVITY IN MY BUSINESS? Most business systems have a method of tracking budgets in their general ledger so you know what your sales and purchases are from last year to this year, but what do you do if you need to drill down into each customer and each supplier to help you meet those company wide targets? With Advanced Budgets, we can help you setup a budget for each customer for each month so you can compare this year and last year to the monthly budget. This will make the salesperson’s job much easier to see who is buying more and who is buying less. If the sales person can also setup a budget on each product, you will quickly pick up when a product becomes more or less popular and can quickly adapt your selling behaviour to achieve the required business outcome.